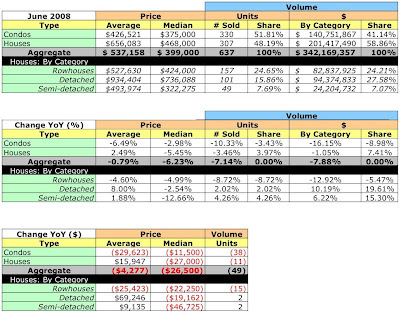 Compared to June 2007, sales volume was down 7.14% and dollar volume was 7.88% lower. As in May, Old City II led the District in sales, accounting for 19.47% of units sold and 16.53% of dollar volume, far higher than any other neighborhood in the District. 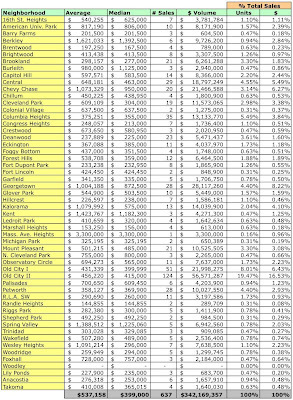 Condos dominated sales in Wards 1, 2, 6, and 8. Fifty three (!) homes sold for more than $1MM; 8.32% of units sold accounted for 27.4% of the month's dollar volume. Each month I offer a copy of that month's sales listings for $5.00. However, I'm offering June's sales listing for free. Please see below. 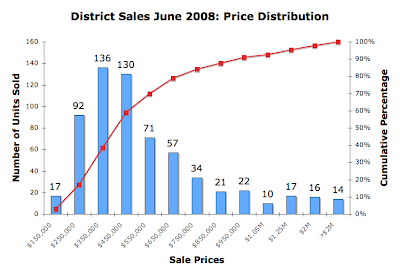 In June 2008 the District recorded 637 residential sales. 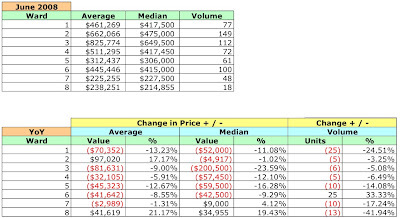 In general, the average price fell a mere 0.79% and the median price fell 6.23%. The condo market is still suffering: unit sales are down 10.33% YoY and dollar volume down 16.15%. Single family home sales were slightly better - average prices rose 2.49%, the median price fell 5.45%, the number of homes sold fell 3.46%, and the dollar volume declined 1.05% - but it's all a matter of degree. All but one ward, Ward 6, had lower unit sales YoY. 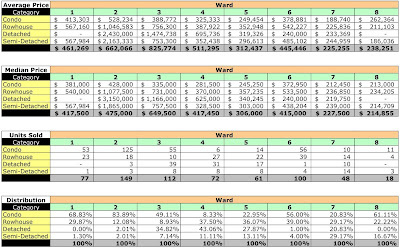 Wards 1 and 8 had higher average prices, Wards 7 and 8 had higher median prices. 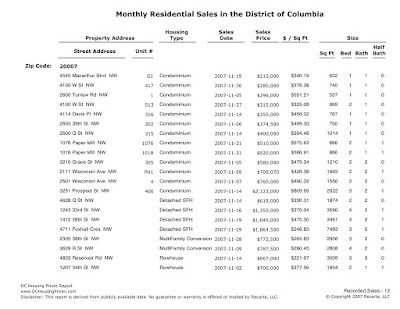 Ward 8 again had the steepest drop in sales volume, dropping almost 42%. Condo sales ruled Ward 2 [again]: 83.89%. YoY, overall demand for single family housing is down 3.46% as measured in unit sales. Average prices were up 2.49% and median prices were down 5.45%. The median price for all categories of single family homes fell. Rowhouses had lower average and median prices while detached and semi-detached homes had higher average prices and higher unit sales. 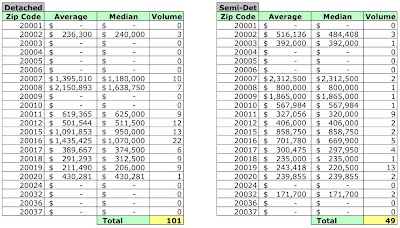 June 2008 average and median sales prices and unit volume by zip code. 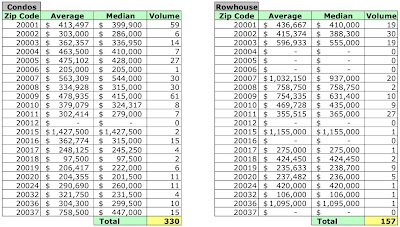 June 2008 average and median sales prices and unit volume by neighborhood.